English 9A & 9B, TED talks! Have you found your topic to talk about? It is time to figure it out this week (week 6). Do you need more inspiration – watch the clips in Blendspace! Also, read the instructions in Dropbox where you might find help. If you need – ask your friends for help. I will also gladely sitt down with you and figure out what to talk about. During week seven it is time to write your speech and to be done with it! I have posted part 1 and part 2 in Dropbox. Read and use them! You might have to use your TTF and also work at home. Part three and four will be posted today (Thursday). 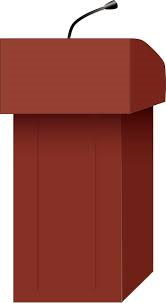 I am counting on you to be done with your speech all together next week (week 7). Last week before the break will be used to practice in front of each other. Helping each other! Remember; practice, practice, practice, practice! Practice makes perfection! You get it!! It is time! Time to voice your opinion about something or tell your experience of something! Anything. You get to choose what to tell the world about. First of all we will we listen to some TED talks in class, held by fifth graders in Årstaskolan – they are something else … Even live broadcast at the time. Like we aim to do it. Then we will watch one american girl and one american boy when they hold their TED talks. Interesting! The first assignment on our path to your own TED talk is to find two TED talks you want your friends to watch and benefit from. When you have found them – you write about them. In Dropbox you have a document that tells you how it is supposed do be done. The document you write is then graded. Of course you will listen to your friends two recommended talks and respond! We will get back to that part. Our last project for this semester in English class will be watching the Movie The Boy in Striped Pyjamas. We have already started the project by reading texts about the concentration camps during the war to get acquaintanted with words that might turn up in the movie and to have some preunderstandig to what happened during World War Two. Since you have, and will study World War Two in social studies, this is a follow up to those studies and also to learn some more. We will also have discussions in small groups where you will get questions to talk about. You will also get the chance to talk about what we have seen and experienced in the movie. 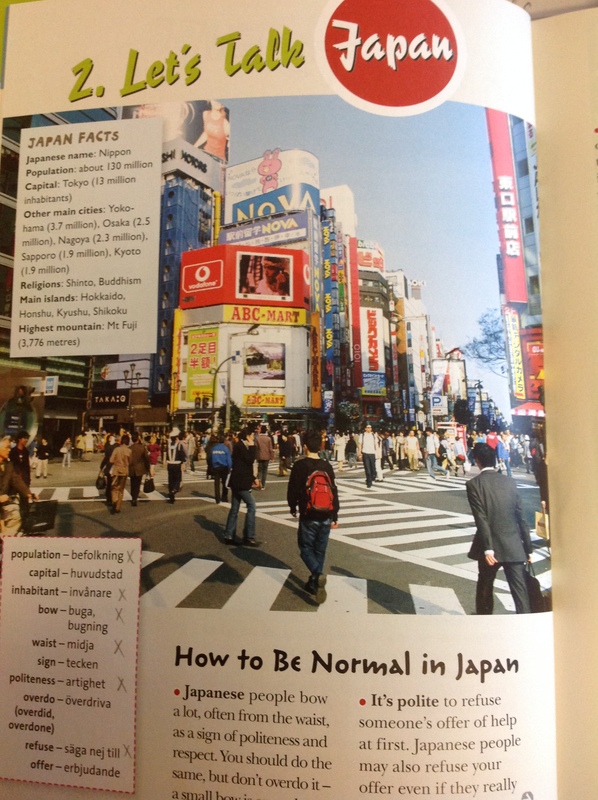 During these weeks we read and study the texts and the new words we learnd in the chapter ”Let’s Talk Japan”. After each text there is a test for you to take. All this to prepar you for our test in week 48, Tuesday. That is when you get to guide and inform a tourist travelling to Japan – about Japan. You get your information from reading the texts in the book. Till dagens lektion har ni läst kapitel 13 +14. Vi börjar med att prata om ord som kanske har ställt till funderingar under läsningens gång. Sedan fortsätter vi med diskussioner i små grupper. Ni får nu chans att diskutera frågor som har med läsandet att göra. Vi går vidare med att tala om hur man kan beskriva en person. Dagens skrivuppgift blir att i skrift beskriva en person som betyder mycket för dig. Ni delas in i små, läser ni era beskrivningar för varandra. Är det möjligt att genom beskrivningen lista ut vem personenär, som har beskrivits? Kan ni gissa vem personen är? Kan ni gissa om det är en kompis, artist, kändis, musiker eller kanske någon ur er familj? Spännande! Efter det ska ni i gruppen förbereda er för att intervjua Ove. Ni gör frågor tillsammans som ska ställas till ”Ove” för att kanske få lite förklaringar till saker och ting. Ni kommer kanske behöva fem-tio frågor. Därefter sätter ni er med en annan grupp som får spela Ove. ”Ove” svarar på frågorna och sedan byter ni så att den andra gruppen får ställa sina frågor till er. Alla skriver ner svaren ni får. Hoppas ni kommer att få reda på nya saker om Ove och kanske att han kan förklara ett och annat också! We are now working with and practising our reading skills by reading texts in our textbook and working with exercises that has to do with them in our workbook. We will work in our workbook, page 31-32, with all the excersices to the text called What is Manga? After that we are moving on to the text called Bushido the Samurai Way. The exercises to that text is in our workbook on pages 33 -34. Work with exercises 1 – 5. Use your reading strategies while you read and work with the texts. During week 41 you will have your verbal test of Freak. You will have your notes with you during the whole test, sit in groups of three and record your conversation. Afterwards you mail your recording to me. During week 42 you will have your writing test of Freak. You will have your written preparations during the whole test. You are going to write a chronicle. Remember to study how to write a chronicle before the test. All information about writing a chronicle is in Dropbox. Also use TTF on Thursday in week 41 to come and talk to me to get help how to write, if you need. You are more then welcome!